Click Here to View Our Event Menu! If you chose "In House Banquet", which location will you be using? If you did not chose "In House Banquet", will you need Staff? All food and beverage consumed on the premises must be supplied by Jake's Steakhouse. Food prepared for functions must be consumed on the premises and is not permitted to leave the premises. 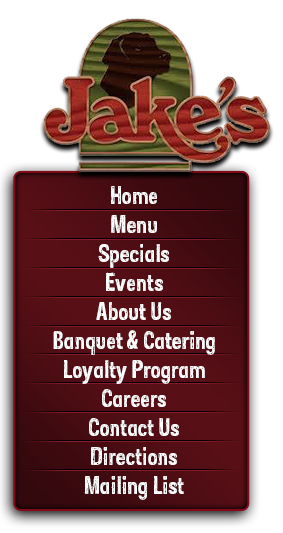 Jake's Steakhouse holds liquor licenses and adheres to all laws imposed by the state of Ohio. No alcohol may be brought to any public functions. No unconsumed alcohol may be taken from the premises. If alcohol consumption appears excessive, the host will be notified immediately. Failure to control reasonable consumption will result in cancelation of bar service. A service charge of 18% is applied to all food and beverage billed. State of Ohio sales tax of 6.5% will be added to all food, beverage, and service charges. Room setup needs and menu selection must be confirmed NO LATER THAN 14 DAYS PRIOR TO THE EVENT. Decorations and signs are permitted but prior approval must be given for any décor or signage that needs to be attached to walls, ceiling, doors, or furniture surfaces. No outdoor signage may be used in connection with the event. A guaranteed number of guests must be received 72 hours prior to the scheduled event. The number guaranteed will stand as the minimum guest for which the client will be charged. Increases in the guaranteed number will be accepted up to 24 hours prior to the event. No reduction in the guaranteed number of guests will be accepted within 72 hours of the event. If the guarantee is not received 72 hours prior to the event, the original number will be considered the minimum number. Final payment for the event is required to be paid upon departure and may be made by cash, check, or credit card. Jake's Steakhouse allows groups to furnish their own cake for special events. Jake's Steakhouse reserves the right to change function rooms and decrease the function space if the number of persons attending the function decreases beyond the capacity of the original room. Any damage incurred as a result of a function will be the result of the person booking the event. Jake's Steakhouse cannot assume the responsibility for the damage to, or the loss of any aritcles left prior to, during, or following an event.